Maximizing return on investment doesn’t take a mathematician. To bring in the most green, have the right setup and select a sealcoating machine that’s powerful, easy to maintain and supported by a reliable manufacturer. Follow these eight tips to get equipment that will quickly pay for itself. Cleaning your pump daily adds up to a lot of downtime, and that downtime quickly eats into your profits. Unfortunately, diaphragm pumps require daily cleaning to avoid the risk of rubber deterioration. Skipping this step can reduce the pump’s life by as much as 50 percent and add up to more than $1,000 in labor costs per pump. Sealcoating machines with piston pumps, on the other hand, must only be rinsed once a year before long-term storage, saving time and money. Minimal maintenance means more uptime. Look for units with leather seals rather than rubber, since they do not require daily maintenance and last nearly twice as long. Rubber seals also require more replacement components, which can cost as much as $1,200 to repair or more than $2,000 to replace. Consider agitators, too. Staggered agitators ensure only one or two agitator arms are engaged with the material at a time, resulting in smooth operation even if sand settles at the bottom. Machines that submerge all agitators at once could stall the agitation system. Also, choose an agitation system with chain reduction, which gives the motor additional torque for effectively breaking up settled sand. Avoid agitators with rubber wipers as these often break and get stuck in the system, causing damage. Also, a hydraulic agitation system, rather than a manual version, eliminates the need to manually turn a crank to stir the sealcoat, which reduces the project’s overall time. Note, too, that plastic tanks lack the durability of steel or other types of metal. They quickly age and may crack in certain weather conditions. For the best ROI, choose a steel tank, which can last longer than 30 years. A storage tank can cut long-term costs, too. With a tank, contractors have the ability to buy material in bulk, which generally reduces the price per gallon. 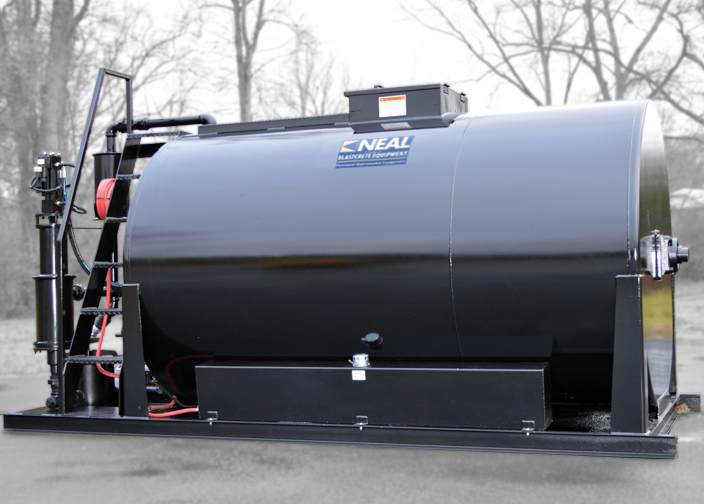 Plus, storage tanks save transportation costs by reducing the trips to a sealcoat provider. Contractors simply refill the application vehicle on site, and the less time the area is closed off for sealcoating, the happier the customer. Oftentimes contractors will even receive increased pay for efficiency. A storage tank contributes to all of that. Having equipment that’s efficient means you can serve customers quickly, and that translates to greater profits. Choosing a drivable machine with a built-in blower and cutting-in attachment is one of the easiest ways to boost productivity. It eliminates the need for additional equipment and labor. In fact, it allows contractors to do the sealcoat prep work as much as seven times faster than with traditional methods. In addition, using a distributor bar is more efficient than a hand wand and reduces labor costs. It takes 20 minutes to empty a 750-gallon tank, compared to a hand wand that takes about an hour and 25 minutes. Versatility is key when it comes to gaining a larger customer base. For the greatest flexibility and opportunity to complete a wide range of jobs with a single piece of equipment, look for a pump that pushes as much as 15 pounds of sand per gallon. You’ll be able to cover large jobs, such as airports and parking lots, yet take on smaller projects, such as driveways. Also, consider a machine that offers both squeegee and spray methods. The squeegee method works well for rough surfaces that require packing material into the cracks and crevices, and the spray method works best on smooth surfaces. Only about 5 percent of contractors own dual applicator machines, so competition for jobs is greatly reduced. Not only that, but the results last 40 percent longer than with the two-coat industry-standard spray method. Having a quality sealcoat machine is half the battle when looking to maximize ROI. For taking profit potential further, work with a reliable, customer-focused manufacturer. That type of commitment will help keep equipment on the job. This means having personal diagnostic assistance available by phone to troubleshoot any problems as well as readily accessible parts for fast replacements. It’s also beneficial when manufacturers offer services for aging equipment, such as upgrades, parts replacements or pump rebuilds, since it helps contractors get even more value from their existing equipment. For a fast ROI, remember to look at all angles of the machine’s cost, from the initial investment to added labor and maintenance costs over time. With these tips in mind, raising ROI is a problem solved.